We’ve had quite an eventful and busy week. Some scary moments like when we had to take my youngest daughter to the hospital after a fall (she is now fine) and some truly magnificent moments of fun… hiking, laughing and sharing good food with great company. I did find some odd moments to stitch. Like now, I just finished packing for the next part of our holiday and everyone is sleeping. I’ve been saving my little serving of Bowmore Gold Reef single malt whiskey and 2 squares of dark chocolate all night so I could enjoy them mindfully at the end of the evening. You can’t see the chocolate in the picture because I ate it already… The whiskey, I am sipping slowly, it’s so smooth! 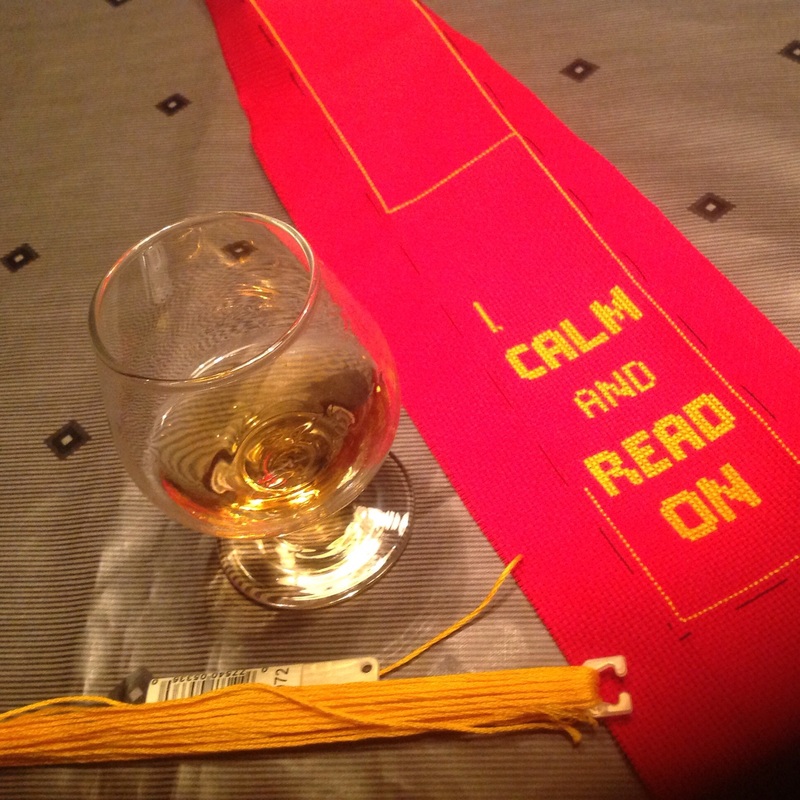 I don’t make a habit of drinking… And specially not of drinking and stitching. However, some occasions call far a little something special. The picture also shows my current WIP, which is also my latest design: Keep Calm and Read On. It’s a nice easy stitch… Perfect holiday project. Happy Mother’s Day to all the mums out there. Hope you make the time in your busy day to truly enjoy a moment for yourself. Those are the moments that re-energize you and allow you to see the beauty in everyday life.